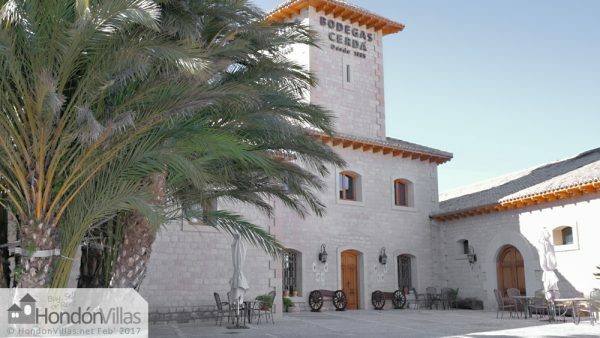 Bodegas Cerdá was founded in 1885 in Hondón de las Nieves, Alicante. It is still a family run wine merchant, shop, restaurant and an outstanding building. You really should pop-in to see the beauty fro yourself and attention to detail, historical wine equipment, stained glass windows and much more. It could grace any European city and is the pride on the Hondon Valley. Most people are surprised at it’s quality, many say it has the “WOW Factor”. Since 2007, the new Bodegas Cerdá invite you to get to know their superb new facilities that include a wine museum, a tasting room and restaurant, a shop for wine and traditional products (gift shop) as well as the production and bottling hall where you can witness the magical world of wine making. Wine tasting evenings are bookable in the excellent upstairs audio visual restaurant.